Are printed books really endangered? With the advent and increasing popularity of ebooks, many doomsday prophets are now proclaiming that printed books will quickly meet their demise. I have heard experts claim that within the next 50 years, traditional books are destined to go the way of vinyl records. They might be used for decoration or sought out by collectors, but other than that, books as we have always known them will be obsolete. Is this true? I hate to think so. Now, don’t get me wrong. I am not one of those purists who believe that ereaders are evil or anything, in fact I own a Kindle myself, but I still prefer the feel of a real book in my hands. Maybe I am old-fashioned or sentimental, but nothing will ever feel the same to me as flipping the pages of a new book. I don’t really want to live in a world where the only place I can buy books is Amazon either. I like the convenience and wide diversity of internet bookstores, but I would much rather browse a brick and mortar store. I could literally spend hours in a cozy bookstore reading area. I prefer to sit down and try a book out before I buy it. Plus, in the bookstore I get to snoop around to see what other people are reading and get in some people watching, which happen to be two of my favorite pastimes. As an author, I can also attest to the fact that there is nothing like holding your own book in your hands. I have had both ebooks and traditional books published, and the ebooks don’t elicit near the excitement from myself or others as the handheld ones do. This fact gives me hope for the future of traditional literature. What about you? 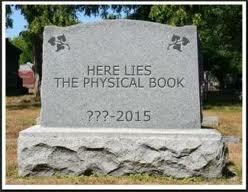 Do you think that printed books are on their last leg? If so, will you consider it a great loss? I hope the ebooks don’t take over! I agree with you when you say that there’s nothing like flipping the pages of a new book! I would consider it a great loss. I’m not into the whole eBook thing, although my girls have Kindles and like getting some of their reading from that. My whole family, for the most part, loves real books over electronic ones. At this point in time, I don’t know if they’ll become obsolete or not. Possibly, but that won’t keep me from adding to my collection. Real books are hard enough to buy where I live due to lack of bookstores. We have a few indies, but they’re expensive and often closed on weekends by the time I get up to town. It’s definitely something to think about. And being a picture book author, I’d really hate to see the printed book become obsolete. Kids use electronics enough as it is. Avant la lecture de cet excellent article, je n’ai jamais pensé au fait que les livres imprimés sont en voie de disparition.